Last week I enjoyed the BBQ chicken with blue cheese slaw wraps so much that I just had to get more of those flavours. The flavours in the wraps reminded me of buffalo wings, pub style where the spicy hot wings are served with a blue cheese dip and some sticks of celery and carrots. Although I was not looking for a greasy meal like chicken wings, a buffalo chicken style salad would be a healthier way to get those flavours. 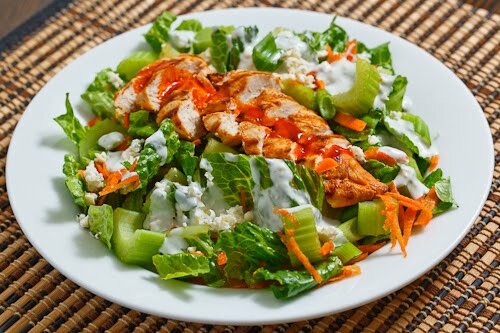 The buffalo chicken salad is a lettuce based salad that includes the carrots and celery, a blue cheese dressing and is topped with a grilled chicken breast that is covered in hot sauce. If you have got your blue cheese dressing ready then this salad is as easy as chopping some vegetables and grilling up some chicken. This salad makes for a pretty nice light meal for a warm summer day and it is certainly packed with flavour. Marinate the chicken in the hot sauce, salt and pepper for 30+ minutes. Brush the oil on the grill and grill the chicken until cooked, about 4-5 minutes per side and set aside while you make the salad. Assemble salad and toss in the dressing. Oh yum! I love main dish salads like this! I bet the spicy chicken with the cool lettuce and blue cheese dressing is a sure fire hit! YUM! Although we are in soup and stew mode down here in Cape Town, this salad will definitely be welcome at my table…love the hot sauce! Love hot wings, this looks like a whole lot healthier way to do it! A delightful sald! I really like tha salad dressing! That looks delicious Kevin. I love blue cheese with anything, particularly Danish blue. I think I'd skip the sauce though and just crumble some straight in there. More buffalo sauce = more deliciousness. Love this! Put me down for some of that salad please – Looks delicious! Oh my goodness! I am so glad I found your blog!! I'm your newest follower and a lover of food. Your pictures make everything look so wonderful. My mouth is watering at this moment… YUM! This sounds so wonderful, Kevin. To me, there is nothing like a salad made with super fresh green and vegetables with homemade dressing. Good idea too, as these flavors are so comforting and scrums! This would be great with shrimp too! Great salad! Indeed a healthier way to enjoy the flavors of buffalo wings in a leaner piece of chicken. And I will take some extra blue cheese dressing! This sounds awesome! A nice spin on a classic favorite. Mmm I love buffalo chicken ANYTHING. Thanks for another great meal, Kevin. Cheers from Dallas, Texas! I enjoyed your post. One of the best parts of cooking is experiencing that feeling of connecting to one's family.